1 Bdrm Top flr Flat. Hall. Living rm. Galley kitch. Bdrm. Shower rm (CT band - A). Price around £73,500 Entry by arr. Viewing contact solicitors. (EPC band - F). 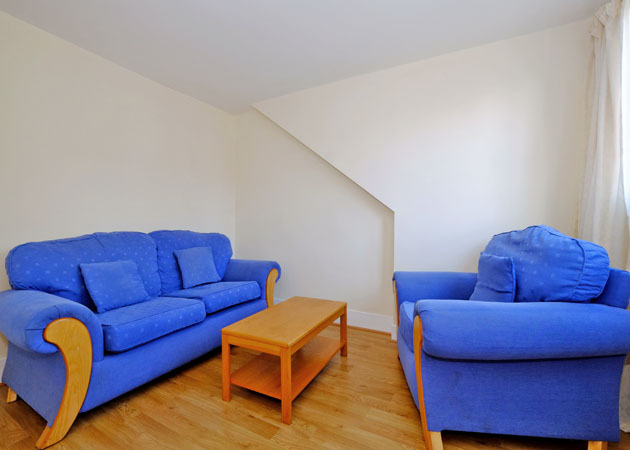 We are delighted to offer for sale this compact TOP FLOOR APARTMENT in a central location very close to the city centre. The property forms part of a traditional granite tenement building with parking available on street. The accommodation comprises: Entrance Hallway with cloak cupboard; Living Room; Shower Room; Galley Kitchen and Double sized Bedroom. 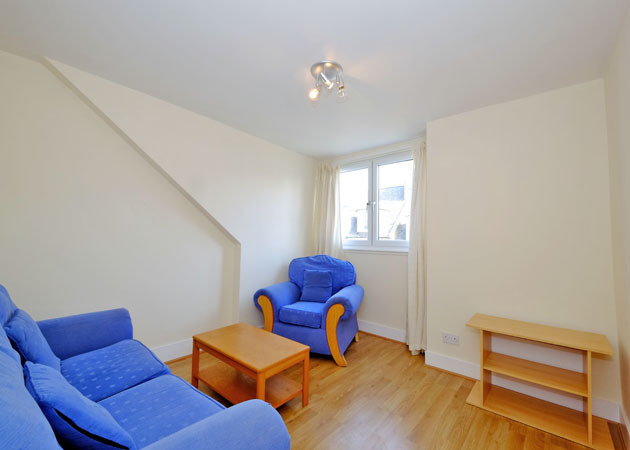 The apartment would provide an excellent first time purchase or investment opportunity for a buy to let investor. The apartment benefits from double glazing. There is a communal garden area and external storage to the rear. The property is perfectly located for accessing the city centre and Rosemount with its variety of independent retailers and businesses. On street parking is available by purchasing a parking permit from Aberdeen City Council. 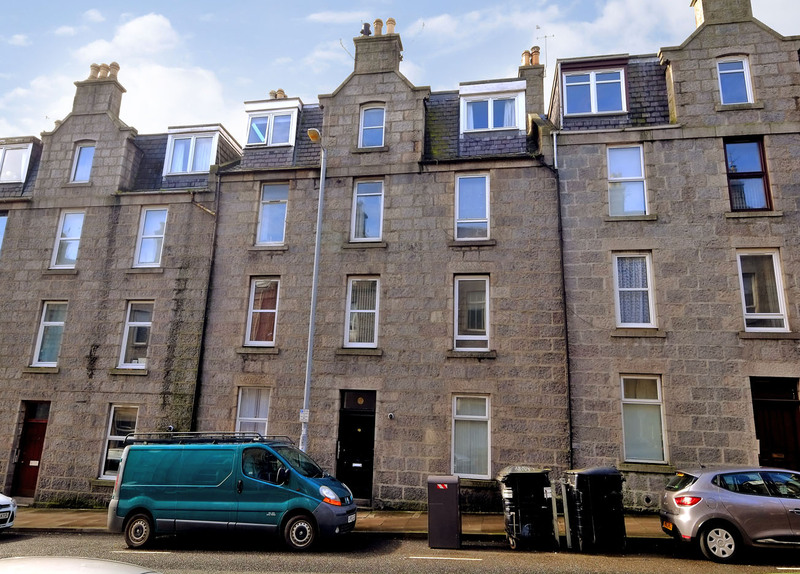 Esslemont Avenue is a popular location for those wishing to live and work in the city centre or requiring easy access to the Aberdeen Royal Infirmary complex or the University of Aberdeen. Travelling elsewhere within and around the City is also easy. Directions: Travelling on Union Street, take the turning on the right into Thistle Street. Continue to the traffic lights and travel straight ahead. At the next set of traffic lights, travel straight again and the property is located a short distance along on the left hand side. ENTRANCE HALLWAY Entry is taken from the communal hallway by way of a solid timber door. The hall has laminate flooring and neutral decoration. There is a ceiling mounted light fitting and high level cupboard housing the electricity meter and fuses. Wall mounted entry phone system. A spacious hall store provides shelf and hanging space. LIVING ROOM 10'10 x 10'8 (3.30m x 3.25m) The flooring is of laminate finish and the decoration is neutral. A uPVC double glazed window overlooks the front of the property. Triple ceiling mounted spotlights. 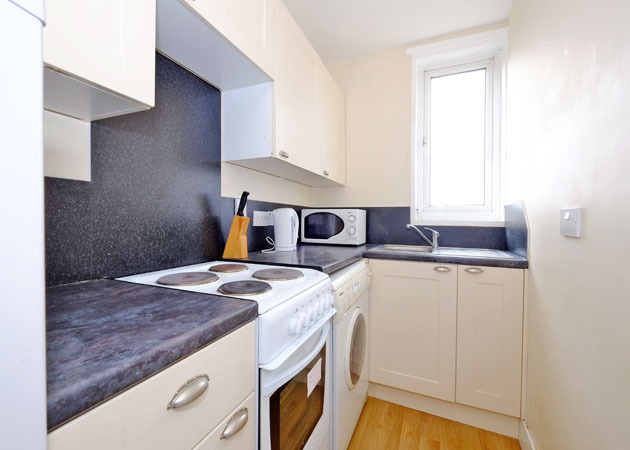 KITCHEN 9'3 x 4'8 (2.82m x 1.42m) The galley kitchen, accessed directly from the hallway, benefits from wall and floor cream coloured modern units with coordinating black splashbacks and work surfaces. A single drainer stainless steel sink is set under the double glazed window overlooking the rear of the property providing an open view over the rooftops. There is a fridge freezer, electric cooker and washing machine. 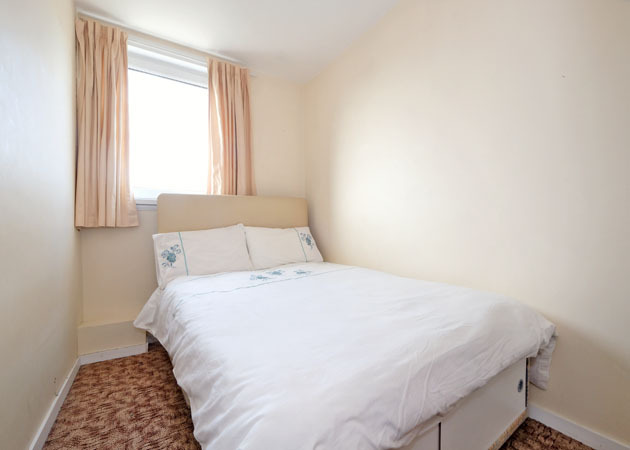 BEDROOM 1 10'4 x 6'7 (3.15m x 2.01m) Accessed from the Kitchen is a double sized bedroom. The floor is carpeted and there is a double glazed window to the rear. Pendant light. 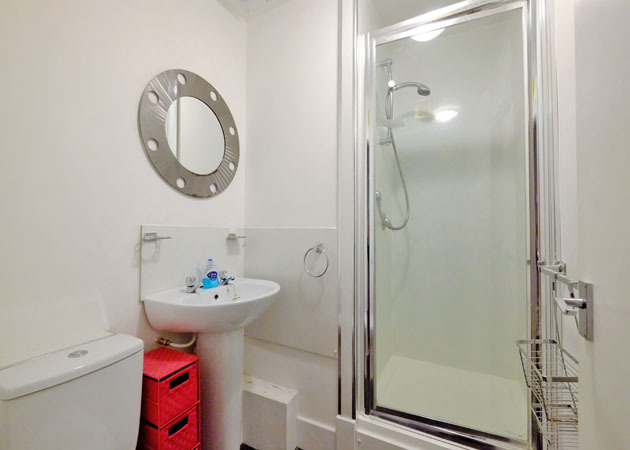 There is a cupboard providing storage and housing the hot water tank and shower pump. SHOWER ROOM The Shower Room comprises a shower cubicle with glazed door and wet wall paneling, pedestal sink and WC. The floor is of tied effect laminate and there is an extractor fan. Ceiling mounted light fitting. 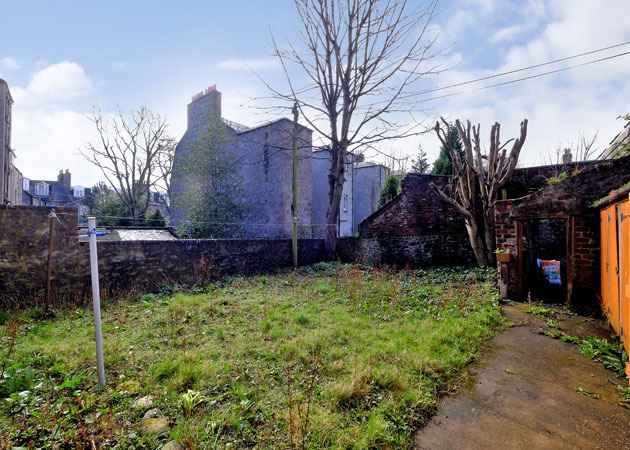 EXTERNAL Externally storage is available in a former coal cellar in the communal back garden and in a locked store on the first floor landing. A hatch on the landing allows access to the attic above. EXTRAS All carpets, blinds and light fittings are included in the sale together with the usual fixtures and fittings in the Kitchen and Shower Room.